While I sit at my parent’s home for the holidays, I thought I’d jump on the blog and keep myself busy. The next installment of the LUT series is on its way, but in the meantime I wanted to talk about Premiere Pro CS6’s merged clips and how they translate through Final Cut Pro XML files to the venerable Final Cut Pro 7. 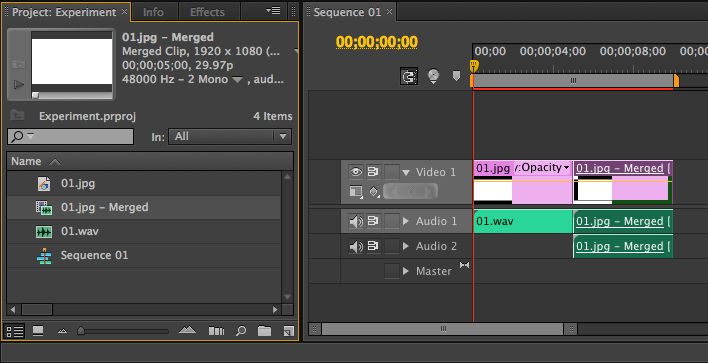 Merged clips are a relatively new feature of Premiere Pro, introduced in CS5.5. Merged clips allow you to group or sync separate audio and video sources, the result acting like a normal master clip. The implementation is a bit haphazard and many recall compatibility issues with XML and AAF exports with content containing merged clips; EDL exports functioned normally. Adobe, in it’s official help documentation, states merged clip limitations for CS5.5. 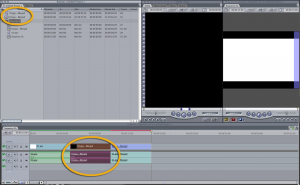 In Premiere Pro CS6, I created a new sequence then added a blank image and blank stereo audio clip. 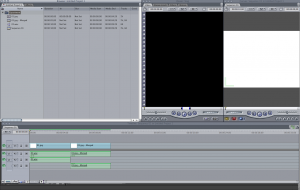 I merged the clips then took the merged clip from the project bin and dropped it next to the original clips. I then exported a Final Cut Pro XML file from Premiere Pro. Next, in Final Cut Pro 7, I imported the resulting XML file. Because the source of the files did not change, they remained on the same drive on my MacBook Pro, the sequenced linked to the original media without issue. Oddly enough, the audio of the merged clip skipped down a track to audio 3 but I believe it’s a side effect of using Premiere Pro CS6’s mono/stereo/other agnostic audio tracks. The issue is easily corrected by unlinking the stereo pair, moving one clip up to audio 2 and relinking the stereo pair. You’ll notice in the screenshot above that Final Cut Pro 7 creates normal master clips in the timeline, but creates a sequence to represent the merged clip within the bin. Don’t believe me? Check out the color coding of the clips when I drag the sequence onto the timeline next to the other clips. That little twist in behavior leads to the biggest complaint when transferring over projects from Premiere Pro CS6 to Final Cut Pro 7: merged clips never seem to relink back to their original media. In Final Cut Pro, unlike Premiere Pro, master clips can exist in a timeline without existing in a bin. If you have issues with relinking merged clips, then select your offline clips from the timeline, drag them to the bin, and master clips will be created. You can then relink media like you would for any other clip. I haven’t had a chance to look into how Premiere Pro’s merged clips react with Blackmagic DaVinci Resolve or Final Cut X but if you have, please post your experience in the comments below.